Multi-Flo is a convenient alternative to a central sewage system or the septic tank and is ideal for the renovation of a failing on-site sewage system. And thanks to its durable, lightweight construction, Multi-Flo can be installed quickly and easily in any location, even those with limiting factors. But most of all, Multi-Flo offers the highest quality of any wastewater treatment system in its class... it's simply the best. Unique to the Multi-Flo System is the quiet, water-cooled, energy efficient submersible aerator and the no by-pass positive filtration design. The Multi-Flo contains 132 square feet of 100 micron fixed film media, which filters the wastewater before it, can be discharged from the system. The Multi-Flo has been Tested and Certified under ANSI/NSF Standard 40 as a Class I System - the Highest Rating. Because of the high degree of treatment, the Multi-Flo effluent is allowed for surface discharge as well as recycle and irrigation use. Founded in 1970, Multi-Flo has set the standard in wastewater treatment. From the day of its inception, Multi-Flo was developed with the highest efficiency - consequently we have never had to change to meet standards required by NSF International (NSF). The Multi-Flo was one of the first systems tested by NSF and has been in continuous production since. We have always maintained those high standards to guarantee a Class I rating. Multi-Flo has sold thousands of units across the country. This success is due not only to the outstanding product, but also to people involved with Multi-Flo. We take pride in our product and stand behind it. Multi-Flo is a company built on reputation. We are committed to our product, our customers, and the environment. Because the Multi-Flo utilizes an "aerobic" treatment process, there are no offensive "rotten egg" odors commonly associated with septic tanks. The specially designed, totally submerged aerator is almost 100% noise-free. This eliminates the annoying noise created by top-mounted aerators and auxillary compressors which must be located in or near the home. This newly redesigned aerator costs only a few cents a day to operate. This is less than the cost to operate most common household appliances. Although periodic, routine maintenance is necessary to insure continuous, trouble-free operation, all service is provided by local factory-trained representatives. The Multi-Flo alarm system alerts the homeowner of any pending problem. The lightweight, single tank design allows for simple installation without the need for heavy, expensive equipment. The durable fiberglass tank can be transported in a pick-up truck. 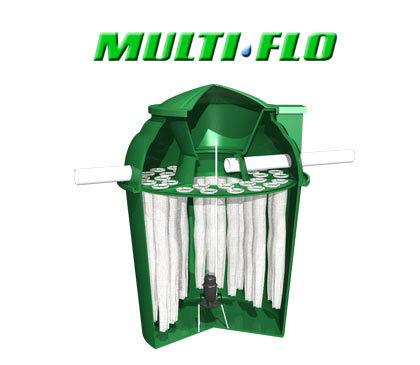 The Multi-Flo requires only a small space (approximately 6' in diameter) for installation. In addition, depending on local and state regulations, it may be permissable to reduce normal drainfield sizing requirements or to discharge the effluent (with disinfection) directly to an approved receiving stream. CHECK WITH YOUR STATE, COUNTY, OR LOCAL REGULATORY OFFICIAL TO DETERMINE IF SUCH REDUCTIONS ARE PERMITTED. Multi-Flo warrants each treatment plant to be free of defects and workmanship for a period of two years from the date of installation. The highly-treated, filtered effluent produced by the Multi-Flo is over 95% free of the normal sewage contaminants that cause the "progressive failure" of conventional systems. Multi-Flo provides five (5) individual treatment plant capacities: 500, 600, 750, 1000, and 1500 gallons per day (GPD). This allows for proper sizing of the plant based upon actual (or anticipated) sewage flows. Mutli-Flo has achieved the highest performance rating from the NSF. Based upon their testing results, the Multi-Flo is one of the most efficient treatment plants in the market.